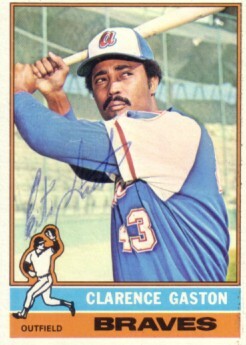 1976 Topps card autographed in blue ballpoint by former outfielder Clarence (Cito) Gaston, whose is more known for managing the Toronto Blue Jays to 1992 and 1993 World Series titles than his playing career. With certificate of authenticity from AutographsForSale.com. ONLY ONE AVAILABLE FOR SALE.